High speed 16-bit analog signal acquisition board. The new GR4 is an expansion for TERN programmable controllers. 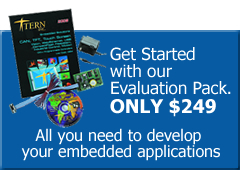 Often, the bottleneck in high speed data acquisition applications comes from CPU overhead. Typical sampling software needs to initiate ADC conversion, read back samples, and then store data into memory. Due to software latency involved in the process, it becomes impossible to implement simultaneous acquisition and recording across multiple analog signals. The GR4 is intended to solve these challenges. The GR4 implements multi-channel data acquisition in hardware. It can start conversions across multiple channels of ADC simultaneously, pushing 16-bit data into FIFO memory, and then stopping as soon as the FIFO buffer is full. Sampling on a second pair of ADC can be triggered upon completion of sampling on the first chip. 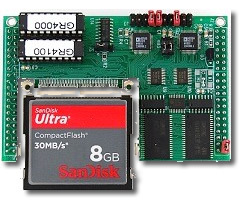 Thus, while the hardware is sampling on one ADC chip to its FIFO, the host CPU can start moving data from the other ADC FIFO buffer into CompactFlash card. A demo of a stack of 4 GR4 units can, in real-time, continuously acquire and store 8 analog signals into CampactFlash cards for hours at 8MB data per second.